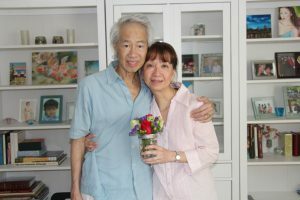 Diagnosed with Leukemia in 2012, Don Eng had spent the last few years undergoing chemotherapy, exploring experimental drug trials, and receiving a stem cell transplant. But now, at age 64, he just wanted to be home. He wished to be comfortable, to listen to his favorite music, and to be with Meryl, his beloved partner of 11 years. He had always wanted to marry Meryl, but it had never happened – until now. During Don’s and Meryl’s initial visit with hospice social worker Tammy Frake, he quietly admitted his long-desired wish. In a sweet whisper, Meryl said yes. “I’d like to marry Don now. I should have done it sooner,” she said. Within two business days, Tammy coordinated the necessary paperwork, enlisted the help of Chaplain Annette Koch to perform the ceremony, Kim Rumaker, manager of social work and spiritual support, to act as a witness, and Christine Corti, communications specialist, to take photos. Also in attendance was hospice nurse Sarah Dileo, RN. At the couple’s request, these were the only five guests in attendance at this intimate occasion. The ceremony, written by Chaplain Annette Koch, spoke to the hearts and souls of all present. We are here today to celebrate the extraordinary love between Don and Meryl. Love organizes our large and sometimes unpredictable world. It is that which enshrines and ennobles our human experience. It is the basis for the peace of family, and the peace of the peoples of the earth. The greatest gift bestowed upon humans is the gift of love freely given between two persons. The words we say today have no magic or prophetic powers. The power of the wedding vows is merely a reflection of a reality that already exists in the hearts and minds of these two people. Nothing I can say, and nothing you can say to each other, will ensure a happy, satisfying and committed marriage. Only your love for one another, and your integrity to make your commitment real, can do that. Wrapped in the bright, low rays of a winter’s sun, Tammy read the lines of an e.e. cummings poem from a piece of white copy paper. The newlyweds cut a lacy, white wedding cake their hospice team had provided at their dining room table as Bryan Adams’ “(Everything I Do) I Do It For You” played on an ipod in the background. And the privileged few guests toasted Don and Meryl with the blueberry champagne the couple had been saving for a special occasion. After 11 years together, Don and Meryl were finally husband and wife. Just four days later, Don passed away as he wanted to − in comfort, peace, and love with his bride at his side.